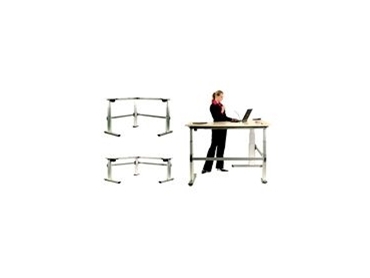 Uplifting Solutions has introduced an innovative new range of electrically operated, height adjustable workstations. The erTgo allows users to work comfortably from their desks while either sitting or standing, and allows Australian architects and ergonomists to specify a much larger range of workstation adjustability and movement than has been previously available. Designed and developed in Europe, the erTgo delivers a cost-effective solution where quick changes in working height are required. Allowing flexibility for both the task and the human requirement, erTgo is very simple to operate and is particularly suitable for drafting and planning environments, or any workplace with a combination of seated and ‘on-your-feet’ type work. A particular advantage of erTgo is the configuration of L shaped workstations and desk tops, as in the illustration of erTgo 3 attached. The L shaped erTgo 3 provides a stroke or height adjustability range from 630 to 1280 mm. Three models of erTgo are available, with the models differing in terms of weight carrying capacity. ErTgo1 lifts up to 80kg. ErTgo2 with a dual motor carries 100kg; while erTgo3 lifts up to 110kg. Desk top shapes and colours can be specified to suit.